In most use cases involving flash storage deployments, the business environment changes, driving a need for higher-performance storage. However, the case of Epic Systems Corporation software is the opposite—the storage requirements haven’t changed recently, but the options for addressing them have. Epic, a privately-held company founded in 1979 and based in Verona,Wisconsin, makes applications for medical groups, hospitals and other healthcare organizations. Epic software typically exhibits high frequency,random storage accesses with stringent latency requirements. IBM has been working with Epic to develop host-side and storage-side solutions to meet these requirements. 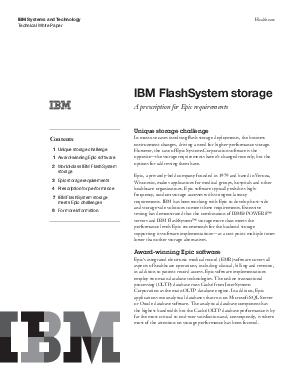 Extensive testing has demonstrated that the combination of IBM® POWER8™ servers and IBM FlashSystem™ storage more than meets the performance levels Epic recommends for the backend storage supporting its software implementations—at a cost point multiple times lower than other storage alternatives.